There are few features of your home that can add the kind of entertainment value, convenience, and sheer fun of an outdoor pool. Whether you’re constructing a new pool or hoping to revamp the one you’ve had for years, you’ll find that lighting serves a crucial role in this process. Here are some things you’ll want to consider when deciding how to light your pool area. Properly lighting your pool involves more than just the lights inside the water itself. You’ll need to focus on each of the three lighting zones – namely, the pool, the pool deck, and the rest of the backyard. Pool lighting helps you see while swimming at night, deck lighting can ensure that you won’t slip and fall around your pool, and lights around the rest of the backyard turn your pool (and the gardens and trees that surround it) into a focal point even from inside your house. By ensuring that all three of these areas have adequate lighting, you’ll improve your pool’s safety and enhance the aesthetics of your backyard oasis. Before you add pool lights, it’s a good idea to map out how and where to place them. In many cases, lights that are placed at just the correct angle can illuminate a far larger area than several poorly-angled lights, so taking this extra planning step can save you time, money, and electricity. Enlisting the help of a pool lighting expert is a good idea to help you with the placement of these lights. A lot of pool owners have budgetary constraints when renovating their pool lighting design. If you don’t have the budget to get all your lighting redesigned at once, evaluate your typical pool usage to see which lighting features are likely to be the most important. 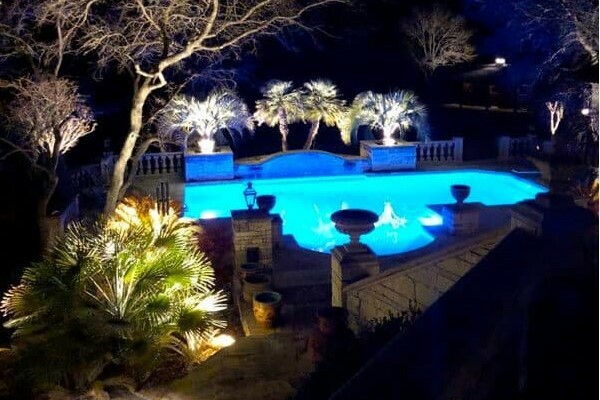 For example, if you find yourself swimming at night far more often than you swim during the day, you may want to concentrate on illuminating the pool itself, then expanding to deck and area lighting as your budget permits. Meanwhile, if your pool is more likely to be surrounded by evening partygoers than to be used for swimming, you may want to start with deck lighting. And if you’re more likely to admire your pool at night than swim in it, backyard lighting may be what you want to focus on first. Each of your three pool lighting zones can have its own basic theme, but all three should complement each other. With today’s technology, you’re no longer limited to choosing a single color for your lights, which makes the theme-selecting process easier than ever. With the wide availability of color-changing LED lights, lighting designers can give you a near-constantly shifting rainbow of color that can even pulse along with the music you play or coordinate with holiday color themes. Regardless of your pool lighting needs or your budget, Enhanced Outdoor Lighting and Design has you covered. 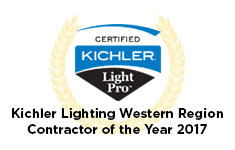 Their experienced lighting specialists can help you achieve any atmosphere by selecting the perfect lights for your lifestyle. For a free, no-obligation quote, visit their website today.